After visiting Lake Erie, Arisa and I took a side trip on the way home to get some Ice Cream. 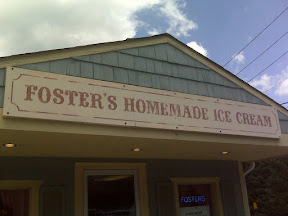 We stopped by Foster's Homemade Ice Cream on Chardon Road in Willoughby, Ohio. We got one cone each of butter pecan and maple nut. Really, really good ice cream. Foster's has parking right in front and some picnic tables of which we took fool advantage. We were there right when it was a bright and sunny day. I must say it was a nice time just the two of us.